We have more than 14,000 Mutual Fund Schemes that are currently available in the market (Equity & Debt Schemes as on Sep, 2017). The Mutual funds are broadly classified as Equity based mutual funds and Debt oriented mutual fund schemes. 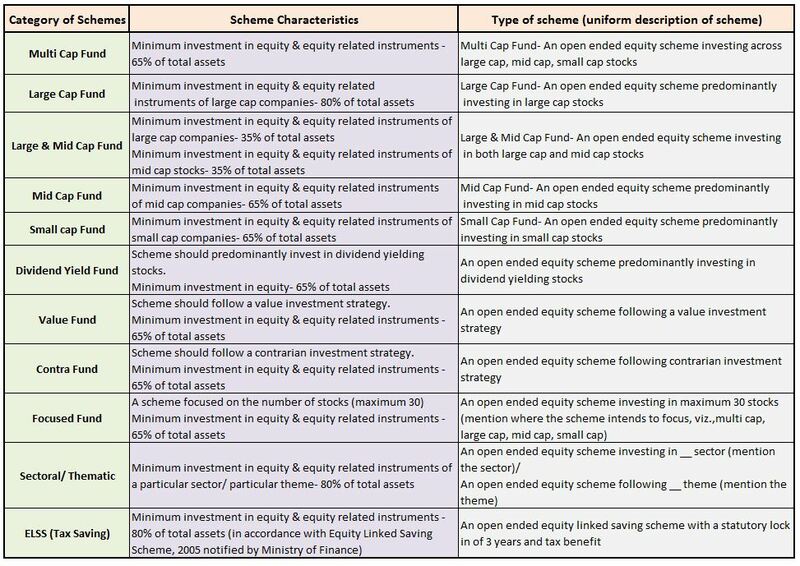 At times, it can be so confusing for a retailer investor to pick a right mutual fund scheme from these various categories. 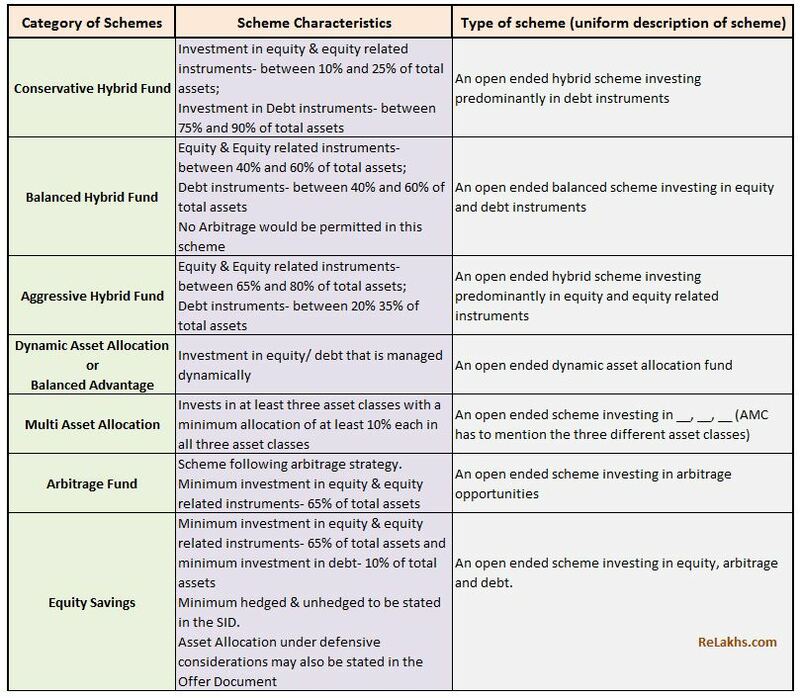 It is often observed that a mutual fund house offers multiple schemes that belong to same fund category, with similar investment objective and investment style. For example : As queried by one of my blog readers (as above), equity fund schemes like Aditya Birla Sun Life Advantage Fund & Birla Equity Fund have similar investment style and profile, both of them are old horses which have been performing decently and belong to same the fund category i.e., Mutli-cap. In such a scenario, a mutual fund investor / advisor can find it tough to pick a right mutual fund scheme. We can find lots of examples like these. If AMCs keep on launching multiple schemes with no clear distinction in terms of asset allocation, investment objective, investment strategy etc., then it can be a challenging task to evaluate the different options and take informed decision. In case of Solution oriented schemes, there will be specified period of lock in. However, the said lock- in period would not be applicable to any existing investment by an investor, registered SIPs and incoming STPs in the existing solution oriented schemes . Mutual Funds will be permitted to offer either Value fund or Contra fund. Large Cap : 1st – 100th company in terms of full market capitalization. Mid Cap : 101st – 250th company in terms of full market capitalization. Small Cap : 251st company onwards in terms of full market capitalization. Mutual Funds would be required to adopt the list of stocks prepared by AMFI in this regard. This list would be uploaded on the AMFI website and the same would be updated every six months based on the data as on the end of June and December of each year. The data shall be available on the AMFI website within 5 calendar days from the end of the 6 months period. Subsequent to any updation in the list, Mutual Funds would have to rebalance their portfolios (if required) in line with updated list, within a period of one month. Mutual Funds will be permitted to offer either an Aggressive Hybrid fund or Balanced fund. Under Multi Asset Allocation category, Foreign securities will not be treated as a separate asset class. Latest update (06-Dec-2017) : SEBI has proposed below new amendments. Corporate Bond Fund : An open ended debt scheme predominantly investing in AA+ and above rated corporate bonds. Credit Risk Fund : An open ended debt scheme predominantly investing in AA and below rated corporate bonds (excluding AA+ rated corporate bonds). Words/ phrases that highlight/ emphasize only the return aspect of the scheme shall not be used in the name of the scheme (for instance Credit Opportunities Fund, High Yield Fund, Credit Advantage etc.). I believe that there is no clear-cut definition for Multi-cap and ELSS fund categories. There are way too many scheme sub-categories under Hybrid category. Classification of hybrid funds like MIP schemes can be a tricky one. These may be classified as ‘Conservative Hybrid fund’ or Multi Asset Allocation fund. For example : Birla MIP Wealth 25 plan can invest in 3 asset classes (Equity, Debt & REITs), hence we need to wait and see how the existing schemes are going to be re-classified. To meet these new guidelines all the mutual fund houses may have to merge, modify or close their available schemes. We will see significant reduction in the number of mutual fund schemes that are available for investment. If an AMC closes a scheme, you have to redeem the units, no exit load will be levied, but you have to watch out for tax implications though. If an AMC switches your existing units to another scheme, I believe that there won’t be any tax implications. (In case, the switching happens from the investor side, taxes (if any) are applicable). Do you believe that this new Mutual Fund Schemes Categorization will be beneficial to all the stakeholders? Kindly share your views. Hello Sree, I have following funds. Can you please guide me how my portfolio looks and whether I should exit any or add another. Thanks. 5. ICICI pru value discovery fund. I like to add another, do you think I should or these are ok and I should continue to SIP in these. You may continue with these funds and can make additional investments (if any) in these schemes itself. How to pick right mutual funds schemes? All the listed funds are good ones. But suggest you to check the portfolio overlap among these funds and can try trimming down your portfolio a bit. what is your opinion regarding NEFTY INDEX FUND is it a good option for investment kindly advice. Dear BHANUDAS ..Kindly read my article on Index funds.. I am an active reader of your website & your articles/advices are invaluable for people like me. 2. Should i keep the invested amount in the schemes for which SIP is not continue or should i switch them as lump sum or stp. All these have covered one yr time since last sip/investment. 3. I want to add Kotak select focus and invesco india contra as sip, is it ok.
4. some of my funds are regular through NJ funds, how can i switch them to direct ones and in terms of lump sum or stp as respective fund houses are saying first you have to exit from them and then you can reinvest. Thanking you of your advice in advance. ABSL TOP 100 is a large cap oriented fund and a good one. HDFC Equity Fund is a multi-cap fund, but as of now its portfolio allocation is large cap oriented and its performance is also not up to mark in recent years. So, you may have a re-look at this fund. ICICI PRU. Balanced fund & Motilal oswal most focussed multicap 35 are fine. There are better funds than Sundaram Select midcap in mid/small cap category. ICICI Focused bluechip, DSP tax saver and Franklin taxshield are fine. Other funds you may have a re-look. Investing in too many funds may not be really beneficial. What is 200 DMA? How to use it in MF investment decisions? 1. I want to add Kotak select focus and invesco india contra as sip, is it ok.
2. some of my funds are regular through NJ funds, how can i switch them to direct ones and in terms of lump sum or stp as respective fund houses are saying first you have to exit from them and then you can reinvest. Kotak select focus is a decent fund. You can use the folio numbers and make fresh contributions to Direct plans of existing schemes. Else, have to switch (redeem) and re-invest in the schemes. Kindly be aware of the tax implications/Exit load. I have my lifetime financial savings of Rs.1Cr of which I have earmarked 15 Lacs for downpayment to purchase a house the next year. I have planned and defined STP from the above Liquid/Debt funds to equity funds as well for the next 2-3 yrs but am not sure if that’s the right way to go about investing 61 Lacs..
1. Pls suggest if I can directly start investing this amount in Equity funds instead of STP. Reason to ask this is, I do not want to lose out on the returns. The liquid funds offer 8% returns PA at best… so should I rather invest these funds directly in say 8-10 Equity/balanced funds? 2. I’m 35 and employed. My financial goal is to buy a house (in 2018 as mentioned) and also aim to get returns of Rs.70000 from 2019 onwards from my corpus of Rs 85 Lacs. I do not have any other commitments/goals. Are you highly dependent on the returns/periodic withdrawals (Rs 70k) from these investments? For how long your would like to withdraw Rs 70k (assuming it per month)? May I know the equity fund scheme names that you have invested in? Hi Sree. Let me clarify as promised, so that there is better light on my financial goal/prob statement. 1. I may not be employed in 1.5 yrs time. So yes, I will need Rs.8.4Lacs PA approx from atleast Mid-2019 onwards, on a “continuous basis” to meet my monthly expenses. By 2018 I may get married and am planning to be employed in a teaching profession – the pay package may not be great. Hence the year by year return need. 2. The amount I am willing to invest as a corpus to get the returns is Rs.85 Lacs as mentioned. My expectation is a return of 10% PA from 2019 to start with… I am willing to stay invested for long (more than 7 yrs atleast). 4. Need your guidance to know if I can split the remaining 61 Lacs into any of the above equity funds/continue with STPs/Any other funds or better way of investing… I am an average risk taker (moderate) and will look for both returns and safety. No other financial goals, except that I will buy a house for residential purposes in 2018 (and I’m planning to buy this by selling a piece of land I own. Avoiding home loan commitments). Return expectation of 10% is very realistic for a 7 to 10 year investment time-rame. The listed funds are good ones individually. But investing in too many funds (over-diversification) may not be really beneficial. If you would like to take moderate risk + consistent withdrawals from your corpus + decent wealth accumulation, may be you need to allocate more % to balanced funds and Large cap funds. You may trim down your portfolio and exposure to mid/small cap funds. STP is a good strategy. And SWP (Systematic Withdrawal plan) can be a good strategy for periodic withdrawals. Best options for lump sum investments! What is 200 DMA & how can it be used for MF investment decisions? Thank you Sree. I am re-doing the investments based on the suggestions and have come up with the below split now ..
1. I have studied your blogs on lumpsum investment. So parked the funds in Liquid funds and I have planned for an STP for 12 months to these funds. Is 12 month ok? 2. I had also checked for fund overlap, and though there were some moderate overlaps, I really was not sure if I should avoid investing in the overlapped funds. Could you kindly see if the above portfolio looks fine and balanced? 3. How do I do retirement planning? Is there anything else I need to do apart from saving/investing in MFs for retirement? If you are investing in the all listed funds then these are plenty I believe. In case, you are not comfortable picking funds, suggest you to consult a fee-only financial planner (in person) as you are investing a large sum of money. STP from liquid funds to equity funds for 12 month period is fine. I hold couple of ELSS’s and 3 monthly MFs – ICICI Pru Discovery, Franklin smaller companies and DSP Blackrock micro fund. Do think I should stop any of these? How much do you advise for monthly SIP under these schemes, I am just investing bare minimum at the moment coz I am new and dont want to risk much. Aside Mutual Funds what other investment options do you advise for surplus money for conservative investor as I have put off buying a house right now. May I know your financial goals, investment objectives and their time-frames?? My Financial Goal, Investment Objectives – Honestly I haven’t thought much about it but I want to build some wealth before I quit working, I don’t have any short term goals. I don’t have much expenses at the moment so I can invest almost salary. I can stay invested for as long as 10 years or even more. If you would like to build wealth, you may have to be a moderate (atleast) risk taker. Can consider adding a balanced mutual fund to your portfolio. Ex : HDFC Balanced fund. Suggest you to kindly go through this article : List of best investment options! Thank you sree, You didn’t tell me shall I continue with the existing MFs? And can you tell how much should a moderate risk taker invest thru monthly SIP in one MF? I was looking at Dividend MFs. Can you suggest any under those? ICICI Pru Discovery, Franklin smaller companies and DSP Blackrock micro fund are good ones, you may continue with them. The quantum of investment is dependent on many factors (your investible surplus, your expected goal amount etc.,), only you can decide on that front! May I know the reason for looking at Dividend option? Do you require periodic income from these investments? Is 5K ok for each of these three funds or is it too risky? I am skeptical, Sorry I keep asking :). Looking at Dividend option just in case worst happens, to not risk all my money. What do you project for these 3 mutual funds and HDFC balanced fund for another 10 years? Do they look good? Losing Rs 1k can be a risky proposition to a few and losing say Rs 1 lakh can be a risky proposition different set of individuals. Do note that returns from MF schemes are not guaranteed, past performance may or many not be repeated. But, if one remains invested in equity oriented products for longer term, the probability of getting decent real rate of return (risk adjusted return) is high. If you do not want to take high risk, you may have to look at some other fund category say Debt funds / Hybrid funds / MIP funds (where risk is lower than equity funds) and not Dividend option. Thank you so much Sree. Really appreciate your quick response. I am gonna look at MIP and Hybrid Funds. Thank you very much. Hope you had a good Christmas. Happy New Year. Dear Nancy ..Thank you for the wishes. Merry Christmas and happy holidays! Have a great 2018 ahead! Thanks Sree. Was a great help. Good day. Hi Sree, Hope you’v had a wonderful start of the year. I am back for one of my friends who asked me to help her with investing. She wants to start with Large Caps. I have shortlisted three for her – Aditya Birla Sun Life Equity, Mirae Asset India Opportunity and Kotak Select Fund. All 3 look good so really confused which one she should go for. I read Mirae Asset is the oldest among 3 and has low risk grade plus its diverisfied scheme…seems interesting. Which one would you have suggested out of 3. May I know her investment time-frame? Are you referring to Birla Frontline Equity (large cap) or Birla Equity fund (multi-cap)? Thanks Sree, She is investing to accumulate wealth, can hold it for 5-10 years. I have shortlisted these(below). Which ONE would you suggest among these two categories, will make it easier for us to select :). She has already purchased HDFC Balanced yesterday. The three large cap funds given have portfolio overlap in the range of 40 to 55%, hence advisable to just pick one. Though Mirae Opp fund is relatively a new fund, it has been performing consistently well with good risk ratios. She may consider one stable and low risk diversified equity fund. Ex: Franklin Prima plus. So, my suggestions would be – Franklin Primaplus, Mirae Opp fund and HDFC balanced fund. (I am assuming that she would like to take moderate risk). Thank you Sree. What is the 2nd balanced fund you suggest, she has already purchased HDFC balanced fund and wants another one in her portfolio. She is going conservative mode. So one Large Cap and two balanced. If so, she may consider, ICICI Pru balanced fund. From past few months I am just following your website related to Mutual funds, it was really nice!! Especially from your comments I learn lot, thanks for that. I am 26 years & I recently entered in Mutual funds. I am planning to start below funds from Jan’18 all are direct growth funds. – I have 2 lakhs in FD for emergency fund. 1. What is your opinion on my portfolio of both current & planning? Please suggest if any change required. 2. I read your article Mutual Fund Schemes Categorization and Rationalization, should I wait until all funds classification? for next investments. 3. My current LIC policy is useful? 1 – May I know if you have any dependents? 2 – Are your investments in ELSS funds for both wealth accumulation + tax saving? 2- Yes, for both. is it suggestible? 3- can you check about my third query? 1 – As you have dependents, suggest you to buy a Term insurance plan and then you may surrender the LIC policy. 2 – May I know if you and your parents are covered with any health insurance plan? 3 – The listed 3 funds (existing) are good ones. We can consider ELSS funds as diversified equity funds as well. So, you may consider to pick one balanced fund and one mid/small cap fund. Fund houses may take time to re-categorize the schemes. Suggest you to go ahead with your investment plan! 1- Ok, I will plan to take the term insurance ASAP. Regarding LIC policy I read your suggested articles & I have a doubt instead of surrender my policy can I make it Paid-up policy? (without paying any further premium payments) because I already paid for 5 years if I surrender now I will get only 30% what I paid, is it correct? 2- currently I have 2 lacks health cover for me & my parents from my company. is it ok? give your opinion on this. 1 – Surrendering or making it a PAID-UP is your choice! 2 – Suggest you to buy a medical cover for self (mediclaim) and seperate mediclaim for your parents. If they do not have any major medical complications, can consider family floater plan for both of them. 3 – You may go ahead with your investment plan. Dsp micro cap has not been performing well since 1 year so should i switch to another scheme???? In one of your blogs about MF Utility, you have mentioned that ‘As of now, the online transaction facility is not yet activated.’ Since this is an old blog, I want to ask if this online transaction facility is available now? Can we invest in various funds without Bank Mandate? I am currently using FundsIndia platform, which provides alerts for payment on SIP date, so I use netbanking for payment. Does such a facility exists in MFUtility platform? Dear Abha .. Yes their online version is available now. I am not sure about the features that you have asked..You may refer to their FAQs. Thank you for yet another informative and interesting read! I’ve been following your articles for a while now and I couldn’t find a way to subscribe to your website in order to receive an email (or some notification) whenever you post a new article. Kindly help me out if there is any way to do so. If you don’t mind, I want an advice from you..
I’d like to make an investment of 50k – 60k for a period of one year. I’ve low to moderate risk tolerance hence I’d expect a return of 8 – 12 %. Kindly suggest which investment tool should I go for? I started out with all the SIPs with no real goal in mind but just to start saving at an young age. Also, SIP period for all is 5 years and invested directly through Mutual Finds Utility. But in one year or so I need to reach a goal of INR 2 Lakhs as I’ve some commitment. Please suggest an appropriate tool or fund in order to achieve my goal. You have low – moderate risk tolerance but your allocation to a small cap is higher than other funds?? Or Are you referring to your risk appetite for lump sum investment? For 1 year period, you may consider Short term debt fund or Arbitrage fund, you may expect returns of around 7 to 8%. The gains on Arbitrage fund are tax-free if units are held for more than 12 months. I already invested in various SIPs for mid – small cap funds hence I’d like to invest a lump-sum of 50 – 60K in some other category with a low – moderate risk tolerance. I looked into the category of Arbitrage funds but was not completely satisfied especially considering the fact that SEBI is asking all the AMCs to accommodate to a certain number of fund types. Do you have any other suggestion in mind? In such a case, how about MIP Funds? Yes, we need to wait for some more time to get clarity on these new guidelines..
You may kindly share to our newsletter, the subscription box is available on the right hand side sidebar (newsletter contains the links of 3-4 articles that have been published recently). You may also LIKE our Facebook page to receive instant notifications when new articles are published. Would you suggest this would investment option for a lump-sum of 50k? For moderate risk – this fund is fine. SIP amount: Rs 20,000/-. Tenure: 10-15 years. Which one is a better portfolio? Or can you suggest any better portfolio? I invest in VPF @ Rs 5000/- per month so I don’t want to invest in debt & Liquid funds. All the listed funds in both the options are decent ones. In the second option, there are multiple funds from same fund category, two large-cap oriented – two multicap – two balanced – two smaller cos fund. How to pick right mutual fund schemes based on risk ratios? Given a choice, I will keep my portfolio as simple as possible, hence would go with the option-1. Will opt for Franklin smaller cos fund only out of the two small-cap funds. Thanks for the advice. I have gone through the two articles referred above & I also feel option one is better. I am yet to open account in MF Utility. I have checked MFUtility website for opening an account but I am a bit overwhelmed with the process. I need to open a CAN; for that, they are asking me if I am KYC complaint. How do I know if I am KYC complaint or not? When I checked on Camskra website, my PAN no is shown as “KYC Registered-New KYC” (I had earlier opened a FundsIndia account; maybe they did my KYC). Does this mean I am KYC complaint & I can go ahead with applying for CAN? Can you please guide me the complete process of opening an account in MFUtility & starting a SIP? If your PAN is kyc compliant then you can go ahead and get CAN. Kindly read : What is new cKYC? You may go through this link – about the different ways to get the CAN..
HOW’S THE IDEA OF GOLD INVESTMENTS VIA BONDS AND OTHER OPTIONS IN CURRENT SCENARIO ? HOW MUCH WILL IT BE PROFITABLE IN A DURATION OF 10 YEARS ? I have never been an investor in Gold! Invest in Gold only if it is absolutely required for you to buy for personal/family consumption. Sovereign Gold bonds – latest issue reviewIs Gold still a risk-free investment? after the new changes that are still to take place fully your article on changed norms is very much needed . Once the AMCs implement the required changes, I will update this post with more information (or) will try to cover it in a separate article. Will surely keep you all up-to-date! I used to offer fee-only Financial Planning (one-to-one) services, but I am now into full-time blogging only! Informative article preparing investor for what is in store. I think it is difficult to guess the implications, which perhaps might be a mixed bag. It might pose a challenge to investors who are not so well versed and may accept whatever is offered by Fund House for good or bad. Another challenge, in case a scheme is closed and amount redeemed, would be to find an alternative investment avenue in the present low interest rate scenario esp. for senior citizens. Yes, as mentioned in my previous comments, there can be some pain in-store for the existing investors! Let’s wait for more clarity/info.. I believe that with the merger of various schemes, there would be a sudden increase in AUM which will definitely adversely affect the returns. I have always believed that when i am investing in an actively managed equity scheme, the AUM size should not be a factor to invest and my fund manager should have the capability to handle such AUMs. Till date, I have not invested in a scheme looking at the AUM size (big/small),given more importance to consistency of returns over the years. The size can be a factor in case when we are investing in a Debt fund Scheme. Thanks Sreekanth for illuminating me on this issue. I always respect your opinion. Wish you and your family a very happy Diwali. Happy Diwali to you too and your family, cheers! Today i have received call from HDFC MF, They do not have any confirmation on Merger/closure of Balanced fund. They ask me to wait for few more weeks for the confirmation from the upper management on this SEBI categorization. For existing MF investors any changes to be followed with this new rules? Dear Sudarshan ..Yes, the existing investors will surely be updated by respective fund houses / RTAs for any necessary action items. For ex : If a fund house decides to close a specific scheme, the existing investors will have to redeem those units. In my opinion, it will definitely help the investor. The provision is “Only one scheme is allowed under each category”. But let’s take a case of HDFC balanced and HDFC prudence fund. Both the funds are managed by different fund managers and have their different styles. HDFC balanced maintains low risk profile when compared with HDFC prudence fund. So may be one investor who would like to take less risk or say comfortable with HDFC balanced fund and another who would like to take more risk and is comfortable with HDFC prudence fund. In case of merger any one of the investor will be in problem. He has to let go his own comfort zone and opt for another. What is the solution for this? As an existing investor, we need to watch-out of all the changes that take place for current investments and take decisions accordingly. If an investor is not in a position to take informed decision, may be it is prudent to take help of a trusted advisor/Financial planner and re-align his/her portfolio based on the requirements. For new investors, this pain will not be there .. I want to select HDFC balanced fund f0r my new Goal. But Now its question whether it will be merged to HDFC prudence or closed by AMC. Should i choose some other fund for the goal. I believe that AMCs may prefer to merge the popular (similar) schemes and may not close the schemes. If you are planning to set up SIPs, you may go ahead with your investments. We may get a clear information over the next 1-3 months.. Thanks for the article. Definitely this move by SEBI will help new investors to select right mutual fund scheme. Lets see how fund houses implement this within given 3 months time. The guidelines do look good and yes, this is a big shake-up. There will be lot of activity from the AMCs side and the existing MF investors may have to go through some pain (temporary).